The Hoerbiger project showcases EBSolute’s expertise in Microsoft technologies. The project also highlights EBSolute’s capabilities to manage diverse teams present at different locations. Hoerbiger Compression Technology is part of Hoerbiger group, headquartered at Austria. Hoerbiger group has global presence in the compressor engineering industry as well as oil, gas and process industry. Hoerbiger Compression Technology manufactures compressors, valves and control systems for various industries. Hoerbiger Compression Technology has a valves manufacturing plant at Ranjangaon, near Pune in India. EBSolute has a long-term relationship with Hoerbiger, going up to 2004 when EBSolute had offered Strategic Consulting services to Hoerbiger. Hoerbiger had wished to achieve enterprise integration for their organization, but due to the huge cost involved, the project was put on hold. Hoerbiger wanted an engineering application that would create an AUTOCAD drawing of Piston or Rider rings based on the inputs given online. After the successful execution of the pilot project, Hoerbiger took EBSolute’s services in redevelopment of their existing application ITKK. ITKK, developed in VB, was primarily used to design different parts of compressors such as valve/cylinder rings. ITKK was also used to manage information related to customers, compressors and the related parts. This application was not accessible via the net. Hoerbiger wished to make this application available on the Intranet. In addition, Hoerbiger wished to completely redevelop the application using the latest technologies and make it more user-friendly. EBSolute provided an offshore development team to execute the pilot project. EBSolute decided to develop the application in VB with integration to AUTOCAD. The inputs would be given through the VB front end. Using AutoLISP, a scripting language for AUTOCAD, taking the inputs from the front end, an output script would be generated. This would be sent to AUTOCAD, where the actual drawing would be generated. The drawing could then be used either by taking a printout or sending it by email. EBSolute then took over the mammoth task of redeveloping ITKK. EBSolute decide to use VB .Net as the frontend. Microsoft SQL 2005 was decided as the database. Web Services were used to access the database. The database design was modified to enhance its efficiency. Migration of the data was undertaken by the Hoerbiger team in Austria. The EBSolute offshore team carried out the user interface redevelopments. Wizards were developed to help the user easily enter the various engineering data required before the design of the valves or other objects can start. EBSolute hired a consultant specifically for this job, as quite a few mathematical and engineering calculations had to be done for developing these wizards. Wizards were developed to help the user easily enter the various engineering data required before the design of the valves or other objects can start. EBSolute hired a consultant specifically for this job as quite a few mathematical and engineering calculations had to be done for developing these wizards. Help was provided to the users on how to use the application through an online help within the application and a facility to chat with live assistants. 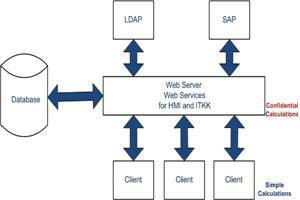 The new application ITKK.Net was made available via the Intranet. Care has been taken to ensure that the application does not crash due to excess load by using concurrent servers. The Hoerbiger project showcases EBSolute’s expertise in handling a project where there were diverse teams working together. There was a team in Austria to gather the requirements. A third party vendor was in the loop as they supported the original ITKK system. The Hoerbiger IT coordinator was present at Hoerbiger’s India office. The EBSolute team doing the front end user interface changes at EBSolute’s Pune office. There was total co-ordination among all the teams and was managed efficiently by EBSolute. Proper version control was used by the offshore EBSolute team to modify the code base, which was located in Austria. EBSolute provided the initial support to Hoerbiger when the application went LIVE. The application is now stable and Hoerbiger is able to manage the application on its own, without any support from EBSolute. The pilot application where a design of a valve is created by giving inputs on the screen has benefitted Hoerbiger tremendously. Frequent changes to a design can now be accommodated without wasting human effort. The ITKK.Net application is now available on the net and the Hoerbiger employees can access the application from anywhere, which was not possible earlier.